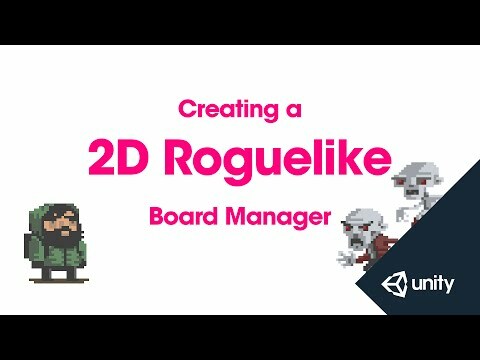 This is part 4 of 14 of the 2D Roguelike tutorial in which we write the BoardManager script which will procedurally or semi-randomly generate our levels. so that they're different each time the player plays. our board manager and game manager scripts. We'll choose Create - C# Script. Call the first one BoardManager. based on the current level number. and to show and hide them using a fold out. so that we can use lists. set that to equal UnityEngine.Random. declaring a serialisable public class called Count. variables called Minimum and Maximum of the type int. when we declare a new count. Next we're going to declare our variables. meaning we're going to have an 8 by 8 game board. we want to spawn in each level. and a maximum of 9 walls per level. We're going to do the same for our Food items. to make up our game board. Exit because there's only one exit object. Let's start with floor tiles. foodTiles, enemyTiles and our outerWallTiles. including a transform called boardHolder. and not fill our hierarchy with objects. InitialiseList that's going to return Void. by calling the Clear function on our list. as a vector3, we'll start with the X axis. for as long as X is less than our number of columns. And then we're going to do the same along the Y axis inside that. to our List grid positions. to place Walls, Enemies or Pickups. the floor of our game board. and the outer wall tiles. X axis and along the Y axis. using the outer wall objects. and prepare to instantiate it. between 0 and the length of the array floor tiles. a number within that array. outer wall tile to instantiate. our outer wall tiles array. instantiate we're actually going to instantiate it. to the object that we're instantiating. because we're working in 2D. and we're going to cast it to a game object. outer wall tiles and our background of floor tiles. like Walls, Enemies and Power ups. that returns a vector3 called RandomPosition. and generate a random number within a range for that. which we're accessing using gridPositions.Count. at our randomly selected index. that grid position from our list. and providing the index randomIndex. to spawn our object in a random location. spawn our tiles at the random position that we've chosen. and it's going to take 3 parameters. a minimum integer called and a maximum integer. minimum and maximum + 1.
we're going to spawn, for example the number of walls in a level. Next we're going to write a for loop. by calling our RandomPosition function. from our array of game objects tileArray to spawn. random number by using Random.Range between 0 and tileArray.length. we've chosen at our random position. We can delete our start and update functions. manager when it's time to actually setup the board. Next we're going to call initialiseList. and also our minimum and our maximum wallCount values. Next we're going to do the same for our foodTiles. to great a logarithmic difficulty progression. and so we're going to cast that to an integer. as the player ascends in level. we're going to lay them out using LayoutObjectAtRandom. case are the same because we're not specifying a random range. Finally we're going to instantiate the exit. Instantiate and parse in the prefab Exit. our game board the exit will still be placed correctly. our Game Manager and setup the Game Manager prefab. using Random = UnityEngine.Random;      //Tells Random to use the Unity Engine random number generator. // Using Serializable allows us to embed a class with sub properties in the inspector. public int minimum;             //Minimum value for our Count class. public int maximum;             //Maximum value for our Count class. public int columns = 8;                                         //Number of columns in our game board. public int rows = 8;                                            //Number of rows in our game board. public Count wallCount = new Count (5, 9);                      //Lower and upper limit for our random number of walls per level. public Count foodCount = new Count (1, 5);                      //Lower and upper limit for our random number of food items per level. public GameObject exit;                                         //Prefab to spawn for exit. public GameObject floorTiles;                                 //Array of floor prefabs. public GameObject wallTiles;                                  //Array of wall prefabs. public GameObject foodTiles;                                  //Array of food prefabs. public GameObject enemyTiles;                                 //Array of enemy prefabs. public GameObject outerWallTiles;                             //Array of outer tile prefabs. private Transform boardHolder;                                  //A variable to store a reference to the transform of our Board object. private List <Vector3> gridPositions = new List <Vector3> ();   //A list of possible locations to place tiles. //Clears our list gridPositions and prepares it to generate a new board. //Loop through x axis (columns). //Within each column, loop through y axis (rows). //At each index add a new Vector3 to our list with the x and y coordinates of that position. //Sets up the outer walls and floor (background) of the game board. //Instantiate Board and set boardHolder to its transform. //Loop along x axis, starting from -1 (to fill corner) with floor or outerwall edge tiles. //Loop along y axis, starting from -1 to place floor or outerwall tiles. //Choose a random tile from our array of floor tile prefabs and prepare to instantiate it. //Check if we current position is at board edge, if so choose a random outer wall prefab from our array of outer wall tiles. //Instantiate the GameObject instance using the prefab chosen for toInstantiate at the Vector3 corresponding to current grid position in loop, cast it to GameObject. //Set the parent of our newly instantiated object instance to boardHolder, this is just organizational to avoid cluttering hierarchy. //RandomPosition returns a random position from our list gridPositions. //Declare an integer randomIndex, set it's value to a random number between 0 and the count of items in our List gridPositions. //Declare a variable of type Vector3 called randomPosition, set it's value to the entry at randomIndex from our List gridPositions. //Remove the entry at randomIndex from the list so that it can't be re-used. //Return the randomly selected Vector3 position. //LayoutObjectAtRandom accepts an array of game objects to choose from along with a minimum and maximum range for the number of objects to create. //Creates the outer walls and floor. //Reset our list of gridpositions. //Instantiate a random number of wall tiles based on minimum and maximum, at randomized positions. //Instantiate a random number of food tiles based on minimum and maximum, at randomized positions. //Instantiate a random number of enemies based on minimum and maximum, at randomized positions.